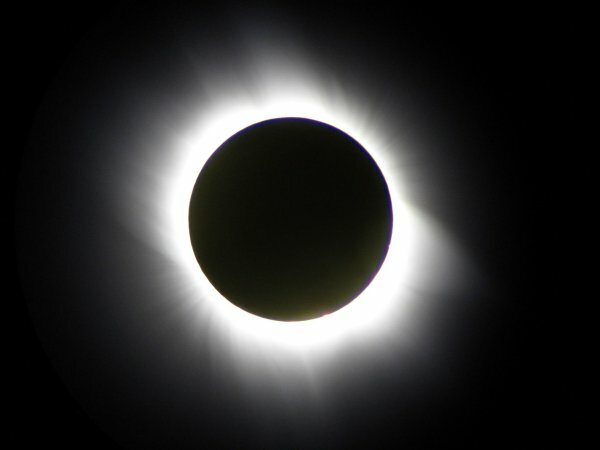 Eric and I visited Turkey in march/april, in order to witness the total solar eclipse on the 29th of march, 2006. Some people see a partial eclipse and wonder why others talk so much about a total eclipse. Seeing a partial eclipse and saying that you have seen an eclipse is like standing outside an opera house and saying that you have seen the opera; in both cases, you have missed the main event. Nobody who has seen a total eclipse laughs at us for going to see one, which sure says something. Seeing the effects of an eclipse on nature, the animals and people around you, is fascinating. The moment of totality is overwhelming. And if you stop to think about the sheer size of it all, about gigantic spheres racing around through space at incredible speeds, enormous distances away from each other, and then all aligning so perfectly, it's hard not to be awed. 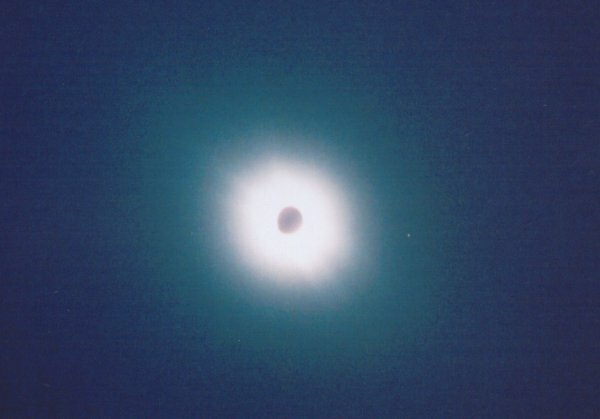 We had seen the total solar eclipse of 1999, in France. This made such a large impression on us, that we decided we were going to try to see a couple more in our lifetimes. We missed a few in the early years of the milennium, in southern Africa. There was no reason not to go to Turkey though: it's very easy and ridiculously cheap to visit from Western Europe. We flew to Antalya on the 28th of march. On the morning of the 29th, we drove our rental car about 70 km eastward along the coast of the Turkish Riviera, to Manavgat. This town was roughly at the center of the band in which the sun was totally eclipsed, which means that the duration of the eclipse would be largest here. 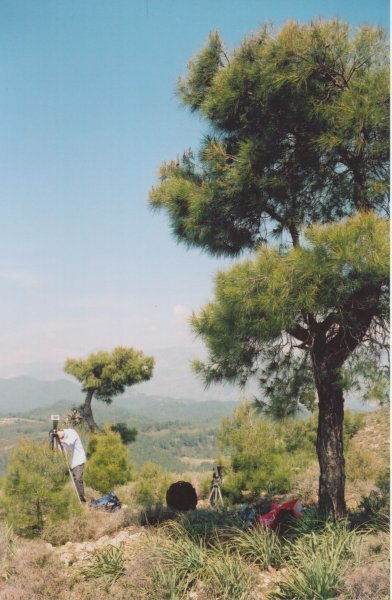 We drove northward from Manavgat, searching for a good spot for watching the eclipse. The spot we were looking for would have to be on a hill high enough to offer a good view of the surrounding landscape. It had to have an especially good view toward the west, which is where the shadow of the moon would be coming from. In addition, it shouldn't be covered in trees, and there'd have to be roads leading up it. It took us about an hour to find "our" hill. We spiraled our way up it, scattering chickens, and driving gravel roads through tiny villages, in which peasant women looked up from their farmwork to stare at us. Up on the hill were two large buses, and a group of about 30 British eclipse-fanatics. They were even accompanied by an eclipse-expert, which made us feel more confident about our choice of hill. Two guides carrying the Brits' lunch had somehow stranded halfway up the hill; we gave them and the lunch a ride up to the top, but then returned a little bit further down, close to the only tree. Eric is directing the telescope at the sun by looking at the camera's LCD screen. 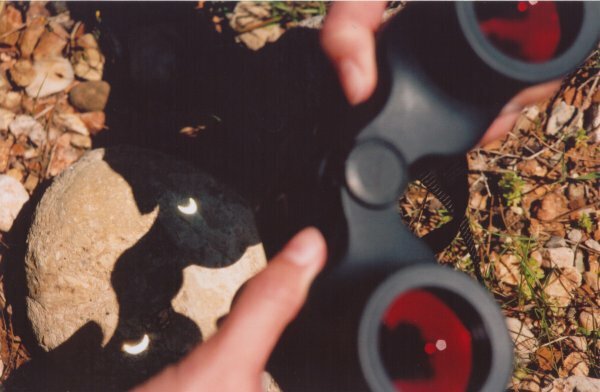 Binoculars, to be used during totality, or for projecting the sun (use the binoculars in reverse) before and after totality. An analogue SLR camera for taking pictures around us. Special little glasses with a filter, that are safe for looking at the sun. See more details on our gear further down on this same page. and that I even put up the hood for warmth. First contact was around 12:30, and we had an hour and a half till totality, but time flew by. We had some sandwiches, used the binoculars to look around us and spy on the Brits up on the hill, and kept our eclipse glasses close at hand to keep snatching looks at the sun. 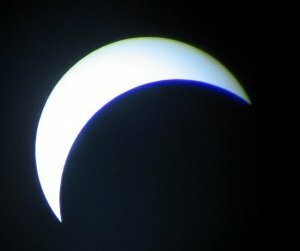 The crescent eaten out of the sun got increasingly larger. When the sun was blotted out roughly halfway, the light started changing noticeably. It didn't get dark, and the sun still threw good shadows, but it was almost as if the light got colder, harsher, bluer. The air also got cooler, definitely. We pulled on sweaters but still found ourselves shivering, though we'd been sweating in T-shirts an hour earlier. Four stages during the progressing partial eclipse, before totality. Then totality came! We had calculated the time at which it would occur pretty accurately, but were still taken slightly by surprise: it came on so quick! 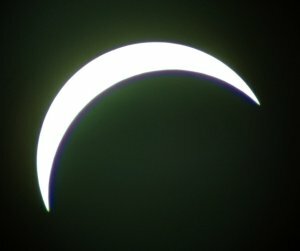 One moment there was still a fairly large crescent, there was still sunshine, and we had our little eclipse glasses on. Then, within seconds, the light pinched to a single bright spot, the Diamond Ring, and then it was gone. We peered about for the shadow of the moon rushing toward us across the ground from the west, but we didn't see it coming. 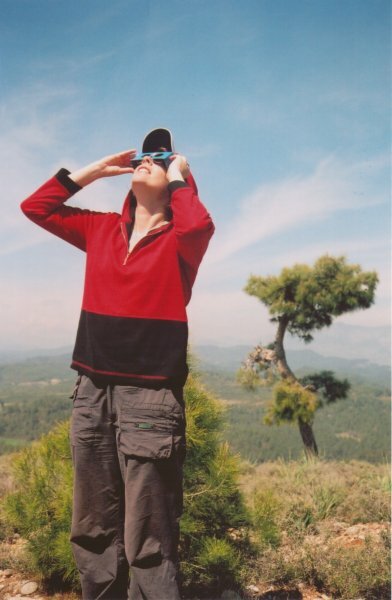 We also didn't see the string of Baily's Beads, that we had seen at our previous eclipse, in 1999 in France, though we definitely did look for them. Totality. Note the darkness of the sky, and the branch of a tree at the bottom left. This picture gives a good impression of what totality looks like with the naked eye. What we did see, and brilliantly, was the eclipsed sun, a black disk surrounded by the flaming corona! It was brilliant, overwhelming, astonishing. We could hear the Brits in the distance, oooohing and aaaahing. Totality took over four minutes, so we had a good chance to look around and take a few pictures as well. The sky was a very dark blue, and stars and planets were clearly visible. All around us though, on the horizon 360 degrees around, the sky was sunset-red. Roosters were crowing. In the village down the hill, they were lighting fireworks (odd timing, in my opinion). People were yelling. approaching: small bright spots are appearing at the bottom right. Although I know what causes an eclipse, and I'm not superstitious, I was surprised to notice that the appearance of the eclipsed sun gave me a feeling not only of wonder. There was also something decidedly threatening about it, something freaky, something weird. The sun is simply not supposed to be black! It didn't take a lot of imagination to picture it as an evil eye, as a terrible omen. I shudder to think what ancient peoples must have thought when this occurred. 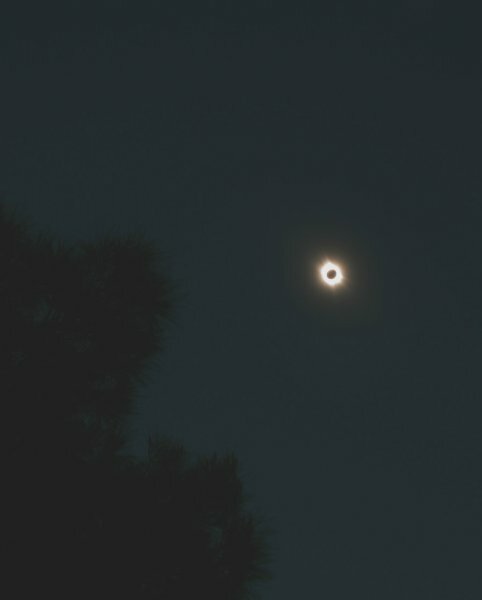 Totality, with different camera aperture settings. Then, before we knew it, totality was over. A bright spot of light appeared on the other side of the moon, and we had to put our eclipse glasses back on. We stayed on until the end of the eclipse, another hour and a half, and witnessed the withdrawing of the disk of the moon. The light returned to normal, the temperature flew right back up, and then it was all over. We were left feeling a little down about its being over. The good news is, we're already planning our visit to another eclipse. There's going to be one in China in 2009, for example, that we may go see. 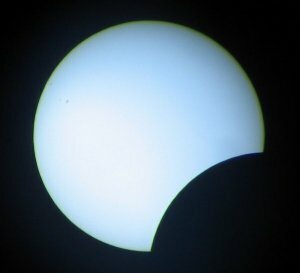 Projecting a partial eclipse through inverted binoculars. Click here to see our location in Google Earth. Google Earth must already be installed. When prompted, select "open." Sometimes, the link below opens up a window showing a zipped file. Double-click on this file, and again select "open" to view the location in Google Earth. A Swarowski telescope (20x - 60x). At 60x enlargement, the disk of the sun pretty much filled the screen of the camera. This way, the corona was not in the picture. In addition, at an enlargement of 60x, it's difficult to get the sun in the middle of the screen, and the movement of the sun through the sky is noticeable (i.e. just when you think you've centered the sun, it's moved...). Therefore, we worked mostly with 20x - 40x enlargement. A mylar filter, in a home-made cardboard frame. We attached the filter to the front of the telescope using... a nail and a rubber band... Don't forget to remove the filter during totality! 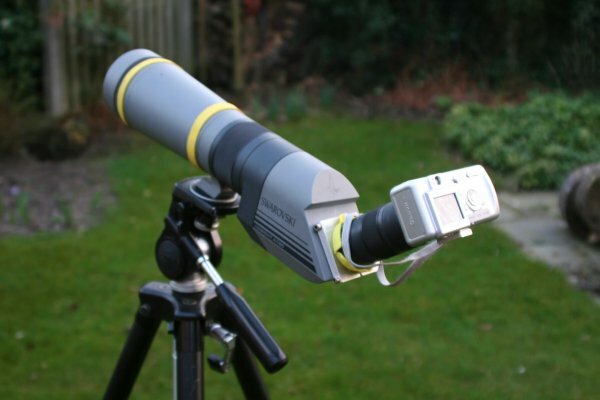 A compact digital camera was attached to the eyepiece, so we could take pictures through the telescope. An additional advantage was that we didn't need to risk damaging our eyesight by looking at the sun through the telescope - we simply looked on the camera's LCD screen when in doubt of the safety. Part D, finally, is the genius bit: a plastic ring fits in the eyepiece. 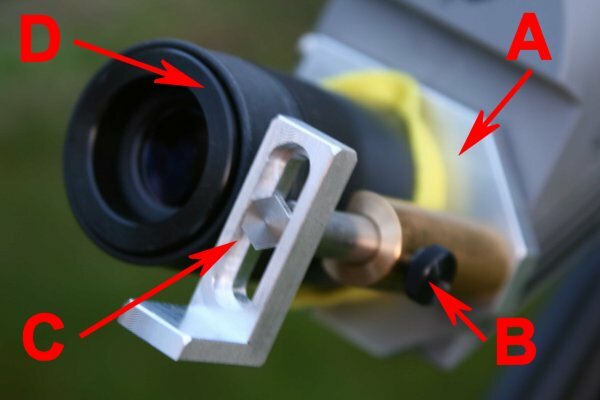 Its outer diameter matches that of the telescope eyepiece, while its inner diameter fits just around the camera lens. 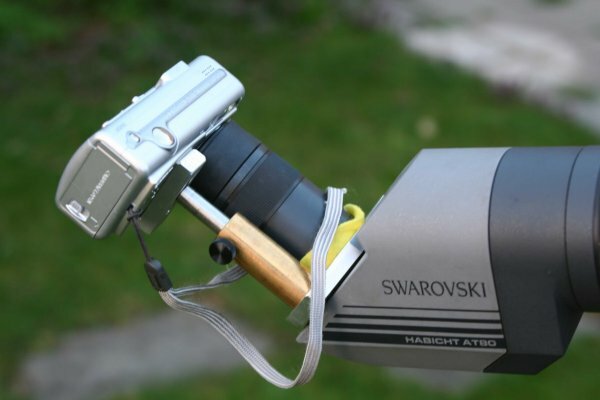 This way, it holds the camera in place, and automatically aligns it with the telescope! 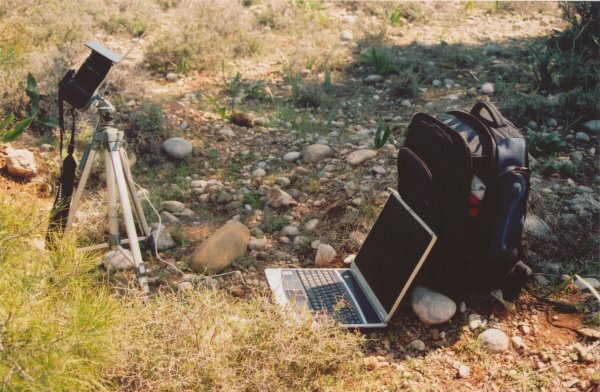 The digital SLR camera, with the glass filter, and the laptop that controls it. A Canon 350D digital SLR camera. A laptop with Canon software, programmed to let this camera take a picture every 5 minutes. The idea here was to make a series of photographs, from the start of the partial eclipse, through totality, to the end of the eclipse. Unfortunately, most of these pictures didn't work out as we used the wrong aperture size. During totality, we programmed the laptop to take a picture every 5 seconds. We fashioned a simple strip that stuck out from the front of the camera, on which we placed a filter made of welding glass. This is almost certainly not the best choice (it gives the pictures a greenish color), but it was the best we had, as the mylar had a directional effect (an ellipse-shaped halo). Note that welding glass is not safe to look through directly, as it doesn't filter UV sufficiently. Camera lens: we used a zoom lens, set at 50 mm. Camera direction: we lined up the camera so that the sun was in the top left corner at 12:30, the start of the partial eclipse (first contact). This way, the sun would move through the sky and end up toward the bottom right by the end of the eclipse (fourth contact). We chose a location with a tree in the picture, for perspective. Photograph storage: the photographs were stored on the laptop. We had about 5 Gb available, which was plenty. The photographs were stored as "raw" files. 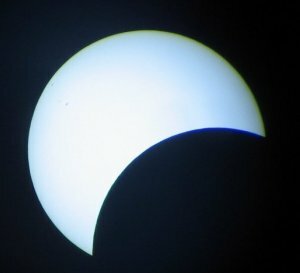 Battery times: from the start to the very end of the eclipse was about 3 hours. The camera batteries didn't make it, and we had to switch them halfway through, which was not easy as the camera had to taken off the tripod to do so - it took some tweaking to get it back in the exact same position. The laptop battery, which was 100% full at the start, just barely made it to the end, with about 3 minutes to spare! We had turned off the laptop screen, and taken care to keep it out of the sun (cooler), to save energy. 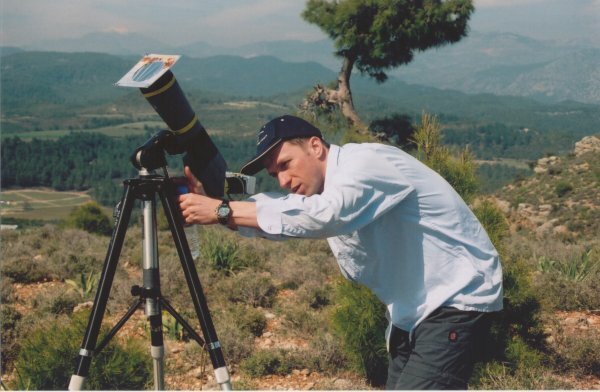 my colleague Jan Kolsters, for letting me borrow the telescope, and drag it all the way to Turkey. When you're going to watch an eclipse, please be very careful about damaging your eyesight. Use filters, such as those special little glasses, and don't take them off too soon. From what I've heard, it's not safe to look at the Diamond Ring without the glasses (though we did, we couldn't resist). Don't take photographs of the partially eclipsed sun without a filter. To be on the safe side, look at the LCD screen on a compact digital camera. 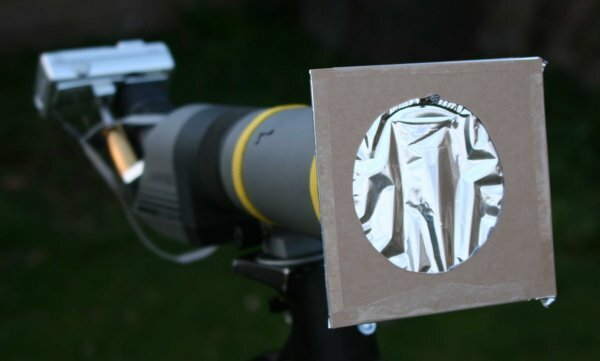 If you're going to use a telescope, be extra super careful! Even with a filter at the telescope entrance, it may not be safe to look through the telescope. Looking through a CD is not safe (and certainly not through the hole :-) ). Looking through welding glass is usually not safe (UV is not removed sufficiently). Looking through a piece of glass with soot on it is not safe. Etcetera etcetera. When in doubt, don't. I just don't want anybody to get excited about eclipses because of this site, and then do irreparable damage to their eyes. 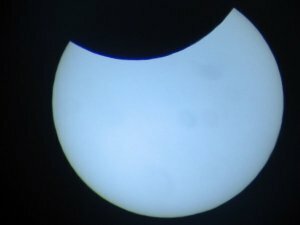 There are many books and internet sites on eclipses, and we looked into many of them. As far as we know, the best book by far is "Totality: Eclipses of the Sun," by Mark Littmann, Ken Willcox, and Fred Espenak (ISBN 0-19-513179-7). This book goes beyond the simplest basics, and provides a variety of information on how to experience an eclipse (what to look for, what to pay attention to), eclipses in history, some of the physics around eclipses, and eclipse photography. It also has a comprehensive appendix, that lists future eclipses upto 2052. Fred Espenak is an astrophysicist at NASA, and apparently an eclipse expert. Search for his name on the internet and you'll find a lot of (recent) information, including lots of info on eclipse photography (this site, amongst others).